For those with no/little drumming experience, but the desire/passion to give the drums a try, this class introduces students to the West African djembe drum. 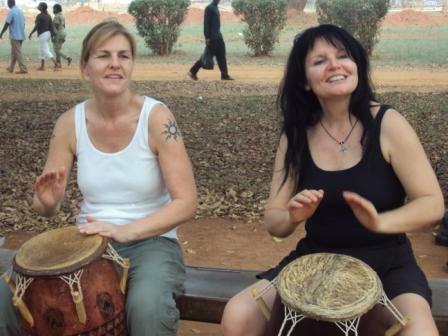 This drum is very popular with drum students outside of Africa due to the range of tones it is able to produce. The true African djembe drums are hand-carved from a solid piece of wood, hollowed out inside and covered on top with a goat hide. This session will begin by developing playing technique using the two main sounds on the drum, the bass note and the open note. Through fun and uncomplicated exercises students will also develop a small repertoire of rhythms, experience the art of playing a drum solo, and learn traditional drum piece incorporating the Ghanaian bell (gankogui) and gourd rattle (axatse). Note: students who have taken one session at the beginner level are encouraged to take another, as the basics should be well established before moving to the next level.